This post covers the Operators section of the PHP Basics chapter when studying for the Zend PHP 7 Certification. 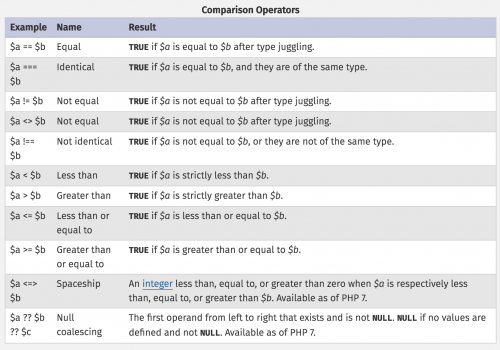 The several types of operators covered are operators commonly used in programming: Arithmetic, Bitwise, Assignment, Comparison, String, Array, Logical, Type and Execution. Like with most programming languages, the basic arithmetic operators are represented by the following characters. There is also the Exponentiation arithmetic operator, introduced in PHP 5.6. Here are some examples of combined operators using arithmetic operators. Combined operators can be seen in more detail in the Assignment Operators section. Bitwise AND, represented with a &, returns the place value present in both variables as represented by the below image. Both values share the bit in third position on place value 4. Bitwise OR, represented with a |, returns bits that are set in either $x or $y. This is because both values have bits set in the first, second, third and fourth positions. Only the place values are added, therefore 8 + 4 + 2 + 1 = 15. Bitwise XOR, represented by a ^, returns bits that are set in $x or $y but not in both. Therefore adding up the place values, 4 + 2 + 1, we get 7. Bitwise NOT, represented by a ~, returns bits that are set in $x but are not set in $y, and vice vera. Bitwise SHIFT LEFT, represented by <<, is for scenarios where if $x and $y are two numbers, BIT SHIFTING shifts $a bits by $b number of steps. Each step refers to multiply by two if it is BIT SHIFT LEFT. If it is BIT SHIFT RIGHT (represented by >>), then each step refers to division by two. The most common assignment operator, =, sets the left operand to the value on the right. Please note that it does not mean ‘is equal to’ as the character implies. $a = ($b = 4) + 5; // $a is set to 9 now, and $b has been set to 4. Assignment by reference means that both variables end up pointing at the same data, and nothing is copied anywhere. ++$a – Pre-increment – Increments $a by one, then returns $a. $a++ – Post-increment – Returns $a, then increments $a by one. --$a – Pre-decrement – Decrements $a by one, then returns $a. $a-- – Post-decrement – Returns $a, then decrements $a by one. The spaceship operator returns the following values. Examples of this can be seen below. The concatenation operator, ., returns the concatenation of its right and left arguments. There is also the concatenating assignment operator, .=, which appends the argument on the right side to the argument on the left side. $a .= "World! ";     // now $a contains "Hello World!" $a + $b – Union of $a and $b. Please note that the + operator returns the right-hand array appended to the left-hand array. If there are array keys that exist in both arrays, only the elements from the left-hand array will be used. The elements from the right-hand array will be ignored. For the first example, the two values apple and banana are taken from $a and the third value cherry, which only exists in $b is taken from $b. $a === $b – Identity – TRUE if $a and $b have the same key/value pairs in the same order and of the same types. This requires that the keys are in the same order in both arrays. $a != $b	Inequality	TRUE if $a is not equal to $b. $a <> $b	Inequality	TRUE if $a is not equal to $b. $a !== $b	Non-identity	TRUE if $a is not identical to $b. instanceof is used to determine whether a PHP variable is an instantiated object of a certain class. Backticks, ``, is the one execution operator that PHP supports. PHP will attempt to execute the contents within the backticks as a shell command. Use of the backtick operator is identical to running the shell_exec() function. Note that the backtick operator is disabled when safe mode is enabled or if shell_exec() is disabled.